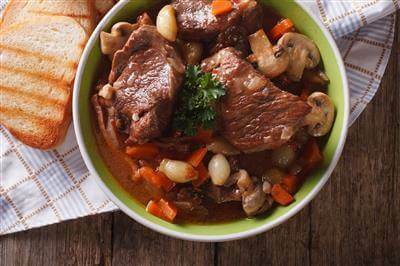 Beef Bourguignon is a classic French recipe and originates from the Burgundy region. 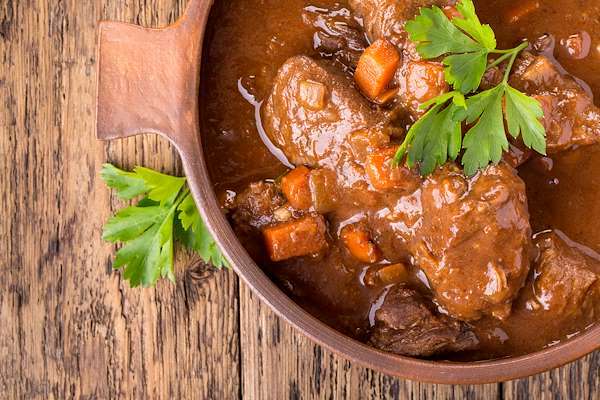 It’s an elevated beef stew braised in cognac, wine, and beef broth, and flavored with carrots, onion, garlic, cognac, tomato paste, fresh mushrooms, and thyme. Serve with toasted country bread and parsley. 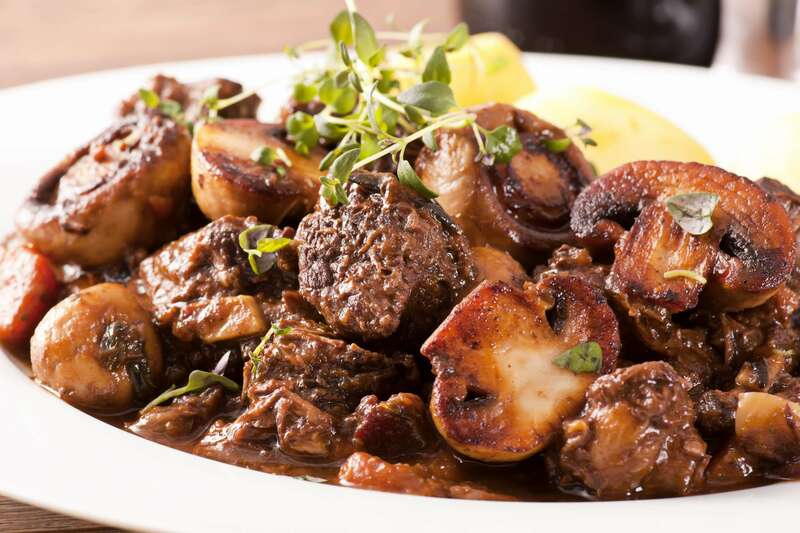 RecipeSavants.com Beef Bourguignon is a classic French recipe and originates from the Burgundy region. It’s an elevated beef stew braised in cognac, wine, and beef broth, and flavored with carrots, onion, garlic, cognac, tomato paste, fresh mushrooms, and thyme. Serve with toasted country bread and parsley. Smart Recipes, European Recipes, Beef Recipes, Recipes Beef European Beef Bourguignon PT2H30M Serves 6 Ingredients: 1 Tablespoon Extra-Virgin Olive Oil 8 Ounces Applewood Smoked Bacon 2.5 Pounds Chuck Beef 2 Tablespoon Salt 2 Tablespoons Freshly Ground Black Pepper 1 Pound Carrots 2 Yellow Onions 4 Cloves Garlic 0.5 Cup Good Quality Cognac 3 Cups Dry Red Wine 2 Cups Beef Broth 1 Tablespoon Tomato Paste 1 Teaspoons Fresh Thyme Leaves 4 Tablespoons Unsalted Butter 3 Tablespoons All-Purpose Flour 1 Pound Frozen Pearl Onions 1 Pound Button Mushrooms Preheat the oven to 250 degrees. In a large Dutch oven, heat oil and cook bacon and for about 10 minutes, stirring occasionally. With a slotted spoon, transfer bacon onto a large plate. With paper towels, dry the beef cubes and season with 1 tablespoon of salt and black pepper. Sear the beef cubes in batches for about 3-5 minutes or until browned completely. Transfer the seared cubes to the plate with bacon. In the same Dutch oven, add yellow onions, carrots, 1 tablespoon of salt and 2 teaspoons of black pepper and cook, about 10-15 minutes, stirring occasionally. Add garlic and cook for about 1 minute. Add Cognac and carefully burn the alcohol off by igniting it. Add cooked beef and bacon with the vegatable mixture and stir to combine. Add tomato paste, thyme, wine and enough broth to cover the mixture and bring to a boil. With a tight-fitting lid, cover the pan and transfer to the oven. Bake for about 1 1/4 hours. In a small bowl, add 2 tablespoons of butter and flour and with a fork, mix well. Remove stew from oven and stir in flour mixture. Add the frozen onions and stir to combine. In a cast-iron skillet, melt 2 tablespoons of butter and sauté mushrooms for about 10 minutes. Transfer the mushrooms into stew and mix well. Place stew over the stove and bring to a boil. Reduce heat and simmer for about 15 minutes. If you enjoyed this easy beef recipe, you'll love these fresh ideas! For all you 'meat and potatoes' cooks out there, this meal provides the perfect spices to bring your meal to the next level. Cooking wine, bacon, and mushrooms help create a savory sauce for chunks of beef. Served alongside creamy mashed potatoes and perfectly seasoned green beans, this is an easy and filling meal your whole family will love.